June Rosemary Gorbett, 73 of Kurtz, passed away on Monday, September 10, 2018, at her home. She was born January 8, 1945, in Indianapolis, Indiana, to the late Glenn Forrest and Effie M. Johnson Drake. June married Riley D. Gorbett on August 26, 1962, and he preceded her in death in 2001. June graduated from Arsenal Technical High School in Indianapolis. She enjoyed all flowers and trees and was an excellent mechanic. She restored several antique and vintage automobiles. 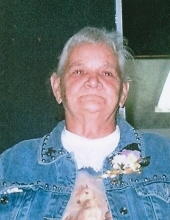 June was a loving homemaker who enjoyed playing with her grandchildren and was a craft enthusiast. She was also an Elder of the Indiana Indian Movement. She is survived by her children, John R. Gorbett, Bessie June (William) Ream, Billy D. (Julie Ann) Gorbett and Bruce L. (Dorothy M.) Gorbett; step-daughters, Ashleigh N. Smith and Crystal L. Blair; grandchildren, Samantha LeeAnn Gorbett, Christopher Gorbett, Jennifer R. Gorbett, Tonya K. (William F.) Montgomery, Robin L. Gorbett, Shawn E. Spence, Ceisha J. Spence, Helen Baker, Mel Ream, Logan Moore, Austin Moore, Jordan Moore, Melody N. Smith, and Leland C. Smith; great-grandchildren, Fredrick Gorbett, Sean Gorbett, Kayle Gorbett, Mason Gorbett, Chyara D. Smith, Logan Moore Jr, Jamie L. Jones and Remington Moore; two sisters, Norma (Neal) Barber and Sue Carol Willougby; a brother, Ralph Edward (Mary) Drake, and several nieces and nephews. She was preceded in death by her husband, parents, and brother, Billy G. Drake. Services will be conducted Friday, September 14, 2018, at 1:00 p.m. at Winklepleck & Brock Funeral Home in Brownstown, Indiana. Friends may call at the funeral home on Friday after 11:00 a.m. until time of service. Burial will be at Kurtz Cemetery. Memorials may be made to Kurtz Church of the Nazarene. To send flowers or a remembrance gift to the family of June Rosemary Gorbett, please visit our Tribute Store. "Email Address" would like to share the life celebration of June Rosemary Gorbett. Click on the "link" to go to share a favorite memory or leave a condolence message for the family.